By Max Lucado Retold by ME! Every wemmick was all made out of wood. Some wemmick's were small, some were tall, some with big noses and some were small, but all made from the same wood maker called Eli. Eli lived in a wood shop, making wemmick's on a hill. People would always gather around Punchinello and give him dots. Every wimmeck had a box of dots and stars. Punchinello got so many dots that one day he didn't even go outside. One day Punchinello met a wemmick called Lucia. Lucia had no dots or stars. Some wemmick's saw that Lucia had no dots so they gave her a star but it didn't stick. Some saw that Lucia had no stars so they gave her dots but it didn't stick. Puchinello asked Lucia how did you do that, well I always visit my wood maker, I want to be like you Lucia, Punchinello cried, go and visit Eli, he live on that hill. Punchinello went home, he looked outside the window and saw the little wemmick's sticking stickers on each other, right away Punchinello went to visit Eli. 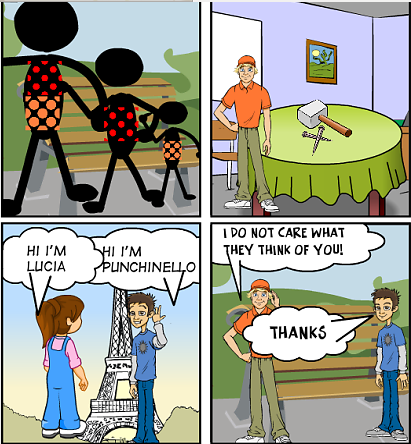 Eli saw Punchinello walk in and said why are you here Punchinello Eli asked, Punchinello was shaking and replied "well I want to be like Lucia," "Lucia?" "yes Lucia," "Punchinello come here" said Eli. Punchinello walked to Eli, Eli said “ I don't care about what anybody thinks of you Punchinello because you are mine” "I'm yours" said Punchinello “yes you are mine and I will always love you”. Eli told Punchinello come see me everyday and you will be like Lucia and from that day on Punchinello visited Eli everyday and the dots were coming off slowly.